Choosing the right cloud, or cloud combination, for your business and its application delivery is one of the most important infrastructure decisions you’ll make. Cloud brings many benefits, however, if it is not managed or controlled proactively, performance can diminish and costs can spiral. This can lead to a poor end-user experience and degraded business performance. Organisations should strike a balance between cloud-based operations to leverage a combination of the best services to form their “hybrid” cloud. This also works from a risk management perspective, as a third-party option can ensure data protection and business continuity in the event of a problem. So, how do you decide what to choose? Consider what’s best for your business. 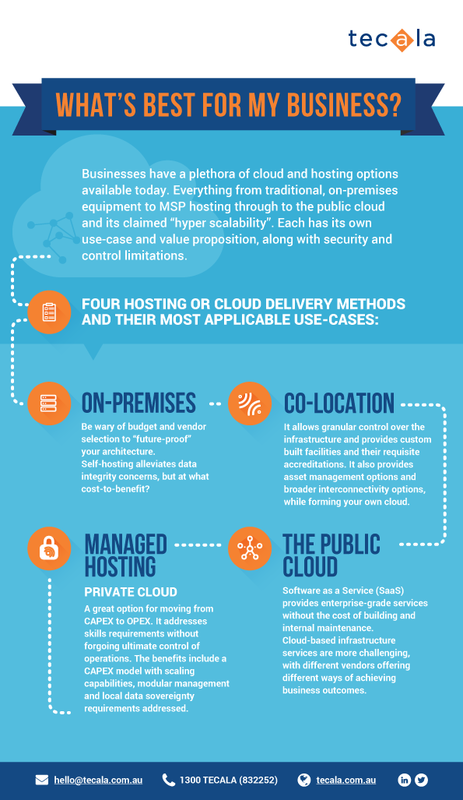 The infographic below showcases four hosting or cloud delivery methods to helps with the process. This simplified view of application hosting and delivery options indicates how diverse clouds really are and why it is important to choose the right one, or right combination. Too much on-premises equipment can lead to high capital expenditure requirements and not enough flexibility, while too much dependence on public clouds can result in high operating costs and a degraded end-user experience.